JETCAM and Bricsys are both strategic partners of LEDAS, specializing in CAM and CAD markets, respectively. One year ago LEDAS introduced top managers of both companies to each other. This action started fruitful cooperation between parties, influenced the plans of development of BricsCAD product, putting integration with JETCAM on the table. TERRASSES DU PORT, Monaco, Jan 2, 2014 - JETCAM International s.a.r.l. and Bricsys nv have announced a technical and commercial partnership that will mutually benefit their respective customer bases. 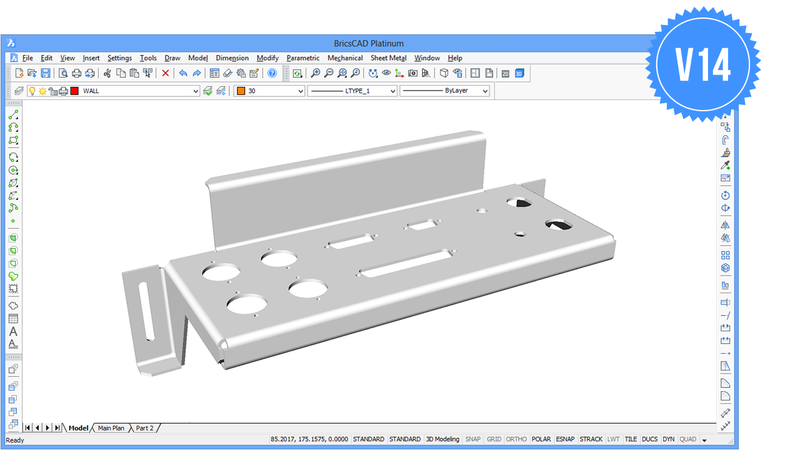 Bricsys recently announced v14 of the successful BricsCAD software platform at their International Conference in Darmstadt, and now supports sheet metal unfolding in the BricsCAD Platinum edition. Development has already commenced on one-click ‘Export to JETCAM’, providing the JETCAM Expert nesting system with all the information required to automatically tool and nest the component. With v14 of BricsCAD, Bricsys continues to deliver on its promise to unify 2D CAD and 3D direct modeling for dwg. In addition to standard dwg CAD functionality the platform now also provides users with 3D direct modeling, 2D and 3D constraints, design intent recognition, assembly modeling and kinematic analysis, and since v14 now also with sheet metal capabilities. JETCAM Expert provides either full interactivity or automation of any stage of the tooling and nesting process. With support for virtually every CNC punching and profiling machine available today, the award-winning software offers high performance nesting options and tight integration into legacy data systems such as MRP. JETCAM International has been developing and distributing its JETCAM Expert range of CADCAM software since 1986. In use in over 70 countries worldwide, JETCAM Expert software supports virtually every CNC punching, laser, plasma, routing, waterjet and flatbed cutting machine available today, allowing users to program any combination of CNC machines with a single CAM system. The software has received various accolades and awards due to its high level of automation and fast return on investment. For more information, please visit www.jetcam.com. Bricsys is a global provider of dwg engineering design software brought to market under the BricsCAD brand. With its relentless commitment to the success of the BricsCAD community, Bricsys is focused on providing industrial-strength CAD software and industry leading support at a compelling price. Its customers can be found in the AEC, GIS, civil engineering, process and power, and mechanical CAD markets. For more information, please visit www.bricsys.com.